One of the biggest surprises in that newly released concept art for Guardians of the Galaxy Vol. 2 was the fact that Gamora was working alongside the superhero team. In the first instalment, she clashed with her “sister” Nebula at the behest of their stepfather Thanos, but it seems as if they’ll be putting their differences aside in the follow-up. Talking in a new interview to promote Star Trek Beyond, Guardians of the Galaxy Vol. 2 star Zoe Saldana had this to say about where we pick up with these two characters. 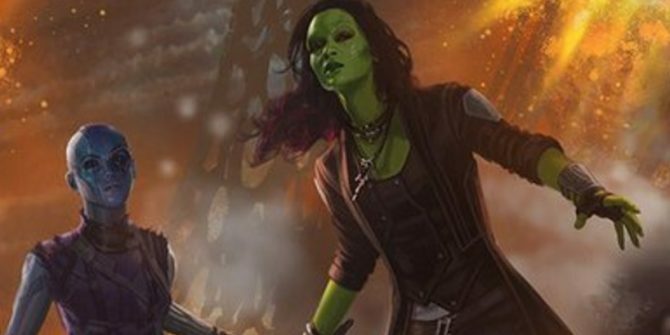 It doesn’t sound as if Gamora and Nebula will suddenly be the best of friends, and seeing how things play out for them in the movie promises to be fascinating. Of course, there’s a lot to be excited about in Guardians of the Galaxy Vol. 2, and despite director James Gunn saying we won’t see Thanos, many fans want to know how it will tie into Avengers: Infinity War. Saldana couldn’t shed too much light on that, but did drop a hint about how The Mad Titan will end up factoring into things. So, he’ll be referenced then, but that may end up being the extent of Thanos’ role in Guardians of the Galaxy Vol. 2. We’ll just have to wait and see, but with the movie expected to make quite the splash at this year’s San Diego Comic-Con, expect more details about Gamora, Nebula, and the rest of the crew to be revealed next weekend.